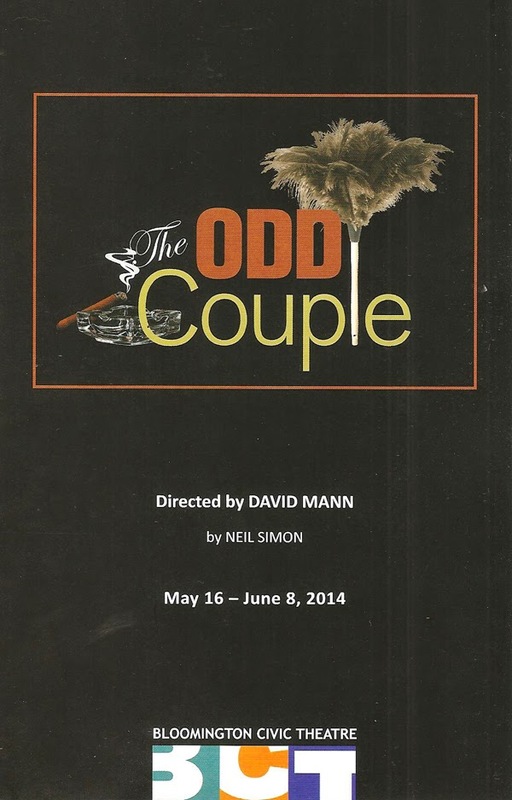 Neil Simon's 1965 play The Odd Couple is an American classic. How many Broadway plays are made into not just a movie, but also a TV sitcom? Everyone knows the story of the two bachelor friends Oscar and Felix living together despite the fact that they're complete opposites and drive each other crazy. Famous Oscar/Felix pairs you may remember include Walter Matthau and Art Carney from the original Broadway version, Matthau and Jack Lemmon from the movie, Jack Klugman and Tony Randall from the TV series, or even Pat Harrington and Tim Conway from a late '80s tour (which I saw, if only I could remember it!). Bloomington Civic Theatre presents another great Odd Couple team in Sam Landman and Wade A. Vaughn (truthfully, the only reason I made the 25 mile drive to see it). Along with the great supporting cast, they present a very funny and entertaining interpretation of a classic. The play opens on a weekly poker game at newly divorced Oscar's messy eight-room NYC apartment. He and his colorful poker buddies (Dave Gangler, Eric Knutson, Joel Raney, and Ben Tallen, all distinctly hilarious) are worried when Felix doesn't show up. A phone call to his wife informs them that he hasn't been heard from since she threw him out the day before, when he vaguely hinted at suicide. When he finally does arrive, they tread gingerly around him and pretend they don't know what has happened, even though it's obvious he wants their attention and support. They finally give it to him, and Oscar invites Felix to stay with him until he gets back on his feet. Fast forward two weeks, and the boys have settled into their routine, which mainly involves Felix cooking and cleaning and badgering Oscar when he strays from the newly defined rules. Oscar decides it would be a good idea to double date with the Pigeon sisters (Dawn Brodey and Katie Willer, delightfully giggly and weepy in their mod dresses and go-go boots). Needless to say things don't go as planned, which leads to a falling out between Oscar and Felix. But the two friends, despite not being able to tolerate living together, are still supportive of each other as they navigate their new lives as divorced men. This really is genius casting by director David Mann, who I believe got the idea after seeing both Sam and Wade in their terrific one-man shows with Loudmouth Collective last year (Thom Pain and Cul-de-Sac, respectively). Sam's cigar-smoking, sarcastic, sloppy, gruff Oscar plays very well off of Wade's sensitive, fastidious, tidy, emotional Felix. It's hugely entertaining to watch the two of them together or with the rest of the cast, in some nicely choreographed poker party scenes. Add Neil Simon's fast and funny dialogue, and you have a great night at the theater. 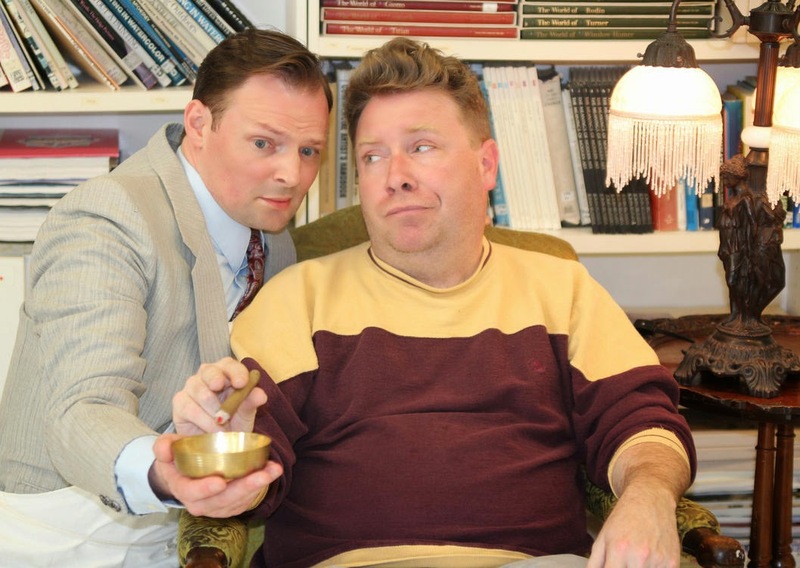 The Odd Couple is virtually sold out for the rest of it's run through June 8, but you might be able to snag a few seats if you call the box office. While the play feels dated, especially in the depiction of the women, it's great fun, and it is a comfort to return to that familiar world of '60s movies/TV (aided by a very detailed set designed by Tamatha Miller and great period costumes by Cindy Forsgren). I've long been a fan of BCT's musicals, but they're doing great work on the play side as well. They have some great shows on the line-up for their 2014-2015 season, both plays and musicals, which may see me making that drive to Bloomington more often.